St Kilda celebrates its hard-fought five-point win at Marvel Stadium. 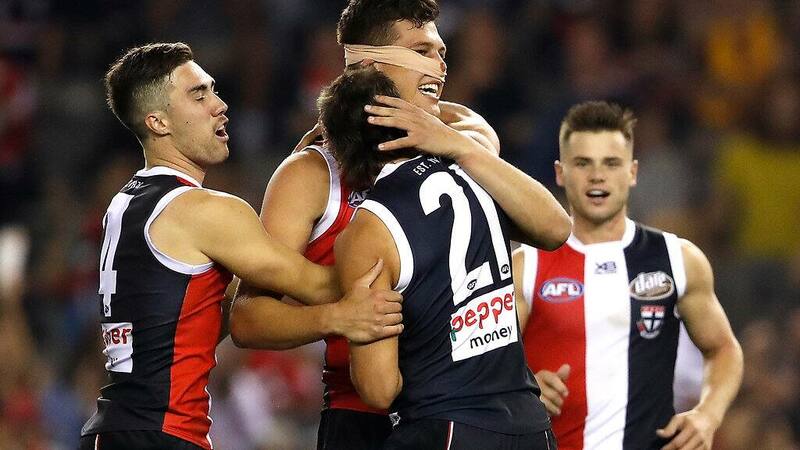 ST KILDA has overcome an injury-ravaged Hawthorn to shock pundits and improve its record to 3-1 after coming from behind to post a hard-fought five-point win at Marvel Stadium on Sunday afternoon. Hawks captain Ben Stratton was concussed while fellow backman James Frawley hurt his left hamstring in the second term, after in-form onballer Jaeger O'Meara was a late withdrawal because of a sore left hip. Scoring all but came to a halt in a tense final term and in a familiar story, the Saints struggled to convert their chances until Jack Lonie goaled to put his side ahead with about five minutes left. The score review system gave Hawthorn a reprieve when Jack Sinclair's snap a minute later was overturned and called a behind, but St Kilda showed resolve to hold on 10.14 (74) to 10.9 (69). Seb Ross captained the Saints in Jarryn Geary's absence because of a virus and stood up with a tremendous performance after a lukewarm start to his season, racking up 39 disposals, 13 contested possessions and booting a long-range goal in the second term. The oft-maligned Jack Billings showed courage when it mattered, holding on for a couple of tough marks to round out a 34-disposal display. Big man Rowan Marshall continued his sterling start to the season by setting up an early goal for Lonie with some quick thinking. That was hardly the extent of his work, doing plenty in the clinches to collect eight clearances, along with an important goal early in the fourth quarter to bring his team within a kick. Hawthorn made a run from late in the opening half, starting when Saints veteran Nathan Brown made a rookie error and gifted Ricky Henderson his second goal by conceding a 50m penalty for overstepping the mark while on the wing. Hawthorn went on with that early in the third, with goals to Luke Breust, Chad Wingard and a classy finish from Tom Scully after a brilliant tap from Paul Puopolo opening up the margin to 26. St Kilda refused to give in though, and aided by the missing Hawthorn defenders, hit back as Lonie came up with some big moments including a tackle on Scrimshaw to set up a Jack Newnes goal. The pint-sized forward didn't reward himself as he could have, booting 3.5. Hawks recruit Scrimshaw's aerial work was a highlight as he and James Sicily took control in the back half, although the former Sun botched a couple of kick-ins. One of those was taken advantage of by exciting forward Ben Long, who returned with a vengeance after being dropped following round one by snapping a couple of goals in the opening half. St Kilda: Tough defender Daniel McKenzie was concussed in the second term and was ruled out of the contest. Speedy forward Matthew Parker went into the rooms in the second term to have a leg issue looked at but he came back on to the field. Hawthorn: Frawley had ice strapped to his left hamstring in the second quarter and didn't return, while Stratton was concussed in the third term. Conor Nash (hamstring/glute) and James Cousins (right leg) both went down the race, while Daniel Howe needed attention for cut to his face, Isaac Smith had his right hand looked at and Chad Wingard suffered a blood nose. Jarman Impey was sore late after a heavy collision. St Kilda will have its first of three games at the MCG this season when it comes up against Melbourne next Saturday. Hawthorn will hope star midfielder O'Meara overcomes a sore left hip ahead of a blockbuster Easter Monday clash against Geelong.